For Women's History Month and beyond, social entrepreneur, activist, and writer/editor April R. Silver announces that she will waive her speaking fee for select engagements, regardless of location, through April 3, 2011. Silver is a respected entrepreneur and activist who has been speaking publicly on the national scene since her student activism days at Howard University. For years, she has moderated panels, given career day presentations, keynoted at college graduations and conferences, and more. She has also addressed non-profits and conducted business workshops for both aspiring and established entrepreneurs. Working seamlessly as a social justice activist, an entrepreneur, and an arts marketing specialist, Silver presents topics that are varied but have a common thread: self-improvement, community improvement, and improving with integrity. Her short bio is below. Essential Communications: What Makes You Special? BRING APRIL TO YOUR EVENT TODAY. 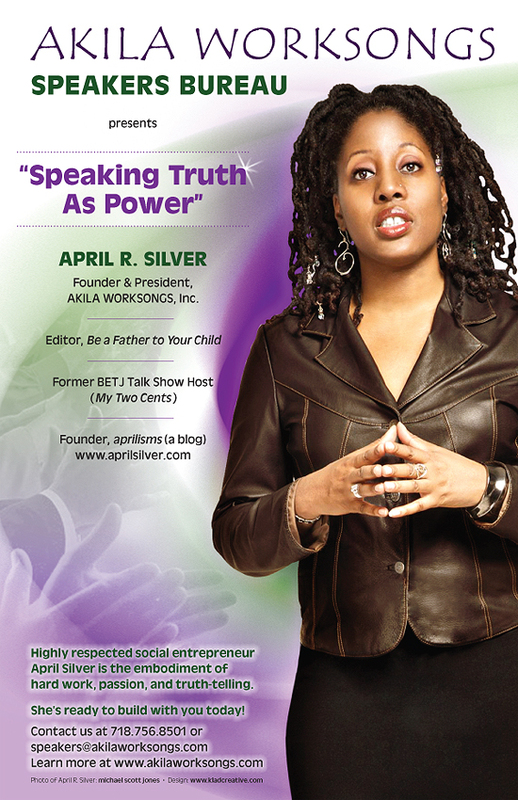 April R. Silver is a social entrepreneur, activist, and writer/editor. She is also Founder and President of AKILA WORKSONGS, Inc., a leading communications and management agency headquartered in New York. The company specializes in "arts and activism" public relations, marketing, and programming (a phrase that Silver is credited with popularizing). 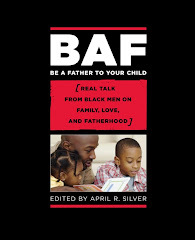 The former talk show host of My Two Cents (on BETJ, now known as Centric TV) is also editor of Be A Father to Your Child: Real Talk from Black Men on Family, Love, and Fatherhood, a critically acclaimed anthology. Silver believes that art must be intertwined with one's pursuit for self knowledge and community empowerment if the pursuit is to be meaning and enduring. Silver's experiences and achievements in the fields of social justice and entrepreneurship have been widely documented for over twenty years. Susan L. Taylor, Editor-in-Chief Emeritus of Essence magazine and Founder of National CARES Mentoring Movement, calls April "a spirited and visionary leader." True to her nature, the Gemini founded Put On BLAST!®, an email/online marketing service created to share news, events, and opinions for and by artists and activists. The database features thousands of email list subscribers, Facebook friends, Twitter followers, and LinkedIn connections. Consistently popular since its launch in 1997, the service has helped place Silver as a trusted voice in new media communications amongst progressive and creative communities. Silver's writings have been published in the NY Daily News, daveyd.com, allhiphop.com, Words.Beats.Life: Global Journal of Hip Hop Culture, and more. In 2010, she served as Managing Editor for "A New Way Forward: Healing What's Hurting Black America" a manual on mentoring and healing, edited by Susan L. Taylor. * Business workshops are excluded. Travel and hotel accommodations are separate and apart from speaking fees. Expenses for round trip travel (ground, train, or air) and hotel (if applicable) are not waived and are the responsibility of the booking entity. For the "Black Men and Fatherhood" presentations, book purchase is required. All engagements also require a written agreement. Drake Holliday is available to answer all inquiries.